The Los Angeles Dodgers are one game away from returning to the NLCS for the second straight season. Considering the Dodgers and the Diamondbacks had the two lowest ERAs in the National League during the regular season, the pitchers haven’t exactly performed up to expectations this series. But the Dodgers have managed to do just enough on the mound, especially out of the bullpen, to secure wins during the first two games. However, the Diamondbacks aren’t likely to fold as they return home for Game 3. It doesn’t get much scarier for opposing pitchers than the middle of Arizona’s lineup. But the Dodgers have proven through two games that lineup depth may be more important. 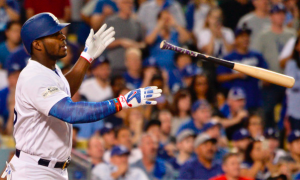 During Game 2, it was Logan Forsythe, Austin Barnes, and Yasiel Puig, the 6-8 hitters in the Los Angeles lineup, that did most of the damage. While Corey Seager, Justin Turner, and Cody Bellinger combined for two hits, seven strikeouts, and 16 runners left on base, the bottom of the order led the Dodgers to victory. The Dodgers have the roster depth to play matchups in the starting lineup and make lineup changes in response to pitching changes, which is why the bottom of their lineup has been so key this series. At the trade deadline, the Dodgers made the move to acquire Yu Darvish, and they did so with the postseason in mind. Darvish pitched well after the move to Los Angeles, going 4-3 with a 3.44 ERA in nine starts. He will face a tough Arizona lineup, but he allowed just two runs over five innings while striking out 10 against the Diamondbacks in August. He has just two career postseason starts, including one last year that did not go well. However, on any given day, Darvish is capable of pitching a gem. The Diamondbacks will come back with Zack Greinke, who started an elimination game against the Rockies last week and will be in the same position on Monday night. Greinke only lasted 3.2 innings against the Rockies before he was pulled, but he’s on regular rest and should be able to bounce back. He’ll face a tough Dodgers lineup that beat him a couple times during the regular season. However, Greinke made back-to-back starts against Los Angeles in late August and early September, holding them to two runs over 13 innings, both games Arizona won. He definitely gives the Diamondbacks a fighting chance to extend the series. The X-factor in Game 3 has to be the Arizona bullpen. This unit was one of the best in baseball during the regular season, but in three postseason games, Arizona relief pitchers have allowed 13 runs (11 earned) in 16 innings. Even if Greinke gives the Diamondbacks a quality start, they can’t expect him to shut down the Dodgers for nine innings. Arizona has plenty of quality relievers who need to put their struggles this postseason behind them and come up big in a big spot in Game 3. The Diamondbacks are too good to get swept, even against a team like the Dodgers. Arizona will have its ace on the mound in Game 3, and Greinke should have a good outing. Darvish will match him for a few innings, but even in defeat, the Diamondbacks have shown the ability to hit the long ball in this series. The Diamondbacks will hit at least a couple home runs in support of Greinke and the bullpen. Arizona wins 6-4.